And then one day I saw a map with paths I hadn’t seen before. It was a map of Europe transfigured by coloured lines, marauding arrows like troop advances that ploughed across borders, over land and sea, connecting regions and cultures that seemed quite separate in my mind: Latin with Slavic, continental with coastal, North African with southern European. These mysterious corridors had names every bit as tantalising as the Silk Road or the Camino de Santiago: the Mistral, the Tramontana, the Foehn, the Sirocco, the Bora. There was even one in the north of England, more brusquely named the Helm. 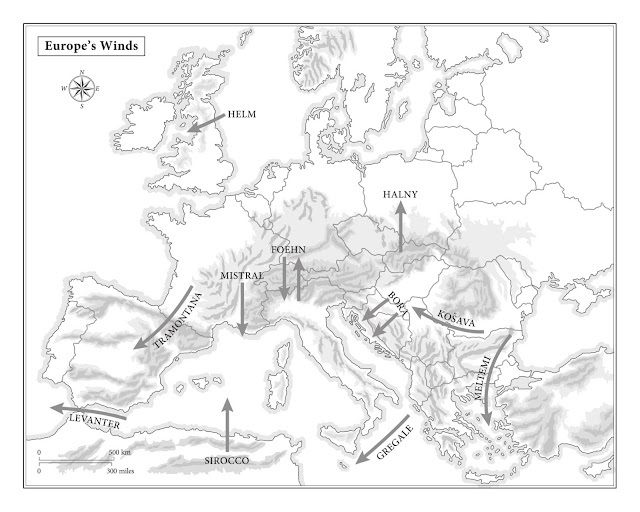 The map showed the routes of local winds, which blow with tremendous force at specific times of year – normally at the transitions between seasons, such as when winter turns to spring – and, I was intrigued to discover, they were said to influence everything from architecture to psychology. The fact that these invisible powers had names, rather than simply compass directions that described where they were from, gave them a sense of majesty, even of personality. They sounded like characters I could meet. Those swooping, plunging arrows suggested routes I might follow, trails that had not been walked before. As soon as I saw that map I knew: I would follow the winds.